​here's a taste of what we do! ​After many years of work by BLM, County, Town, Chamber & WCF leaders, an agreement between BLM & Maricopa County to start implementing Vulture Mountains Regional Park. Our representatives former supervisor Max Wilson and present Supervisor Clint Hickman made sure our local voices were heard. By unanimous vote, the Board of Supervisors approved the agenda item and signed documents to move forward. Hassayampa 5th grade trail blazers mapped and marked the "Coyote Trail" on the TNC property east of the school. WCF's Educational Use Agreement with The Nature Conservancy makes it possible for students to use the property for outdoor education. 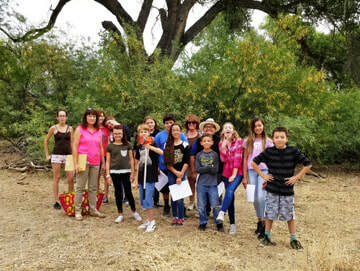 Desert Awareness program encourages students to observe, ask questions and understand the interrelationships between the desert's plants and animals and the importance of water. Desert Survival presented by the Yavapai Search and Rescue team.